Derek McInnes hopes Graeme Shinnie's "strong relationship" with himself and the Aberdeen support will hold sway as his captain considers his future. The 27-year-old midfielder showed his worth again by scoring both goals in Saturday's win over St Johnstone. "He's got a lot to contend with at the minute," the manager told BBC Scotland. "He's got a lot to think about, but there's no doubting his love for the club and his pride in being captain here." Shinnie, who joined the Dons from Inverness Caledonian Thistle in 2015, is out of contract in the summer and now able to talk to other clubs. McInnes had said at the turn of the month that he expected the Scotland midfielder to give Aberdeen "clarity" over his future in the following two weeks but gave no indication that this had yet been forthcoming. "We have such a strong relationship, him and I, as do the supporters and Graeme," the manager said. "We're hanging on to that really and hoping that that can be a huge part in any decision he makes." 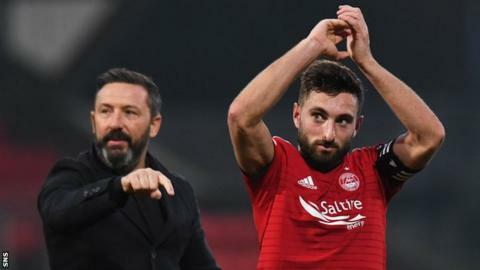 Despite his admiration for Shinnie, McInnes was pleased that the player, who started his career at full-back, had responded to his desire to see an even greater contribution going forward. "I said to him earlier, I think he had only scored six goals in 130-odd games for us and he needed to score more," he said. "He practices in training, left foot and right foot - he's always wanting to do more - and it was great to see him driving into that space that was created and finishing his goals off, left foot and right foot. "The second was particularly special in front of the supporters."